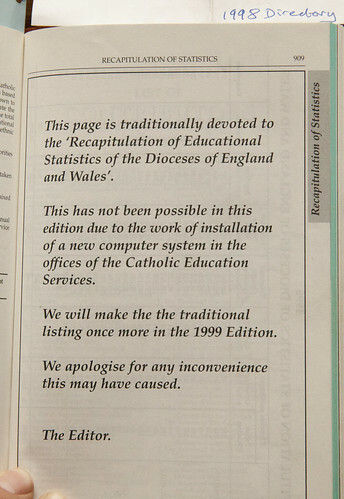 Looking over the Catholic Directories from 1839 to the present was interesting in a number of ways. 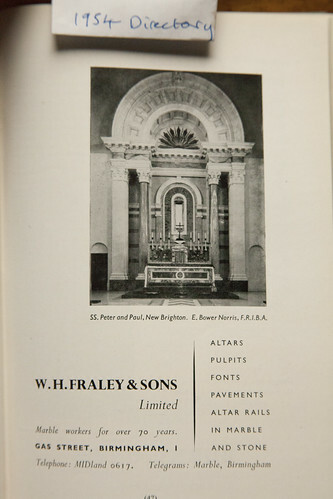 The adverts, which got going after the War, show architectural and liturgical items which are actually rather nice and well-made in the 1950s; later there are endless ugly promotions for CAFOD; today there are endless adverts for schools,l generally Catholic in name only. Here's an early one which caught my eye: the Dome of Home, SS Peter and Paul and St Philomena, in the Wirral, clearly a prestige project for the architects who are using the High Altar to drum up more custom. Early 20th century Directories periodically included a map of the Dioceses. It would be very useful if it were possible to get hold of an up to date one. 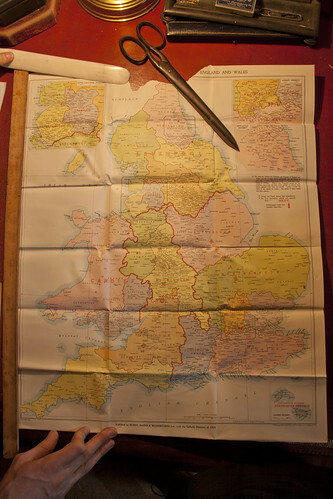 In this one the dioceses of Wrexham, Menevia, East Anglia and Arundel and Brighton don't yet exist. In the very early editions, going into the 'Laity's Directory' before 1839, there are complete catalogues of Catholic books: pages and pages of books for sale, on history, 'controversy', theology and so on. Real evidence of a 'well instructed laity', and a scholarly community to serve them. The gaps in the data are infuriating; I get the impression that at certain points they just didn't care. 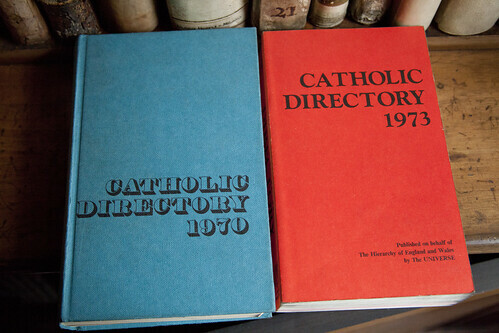 They gave up reprinting two years of tables in 1990, a practice of the Directory dating back to 1925. Why? It means the series is more vulnerable to glitches and errors; a number of time the reprinted table has slightly revised numbers. The date of the data for Baptisms, Marriages, and Conversions was always one or two years earlier than the date of the rest of the table (numbers of clergy, places of worship, and Catholic population), from 1912 to 1994, at which point they decided to bring them into line. Fine: but they didn't bother to print the missing year's numbers, those for 1992. Why? Two years' Directories were never printed, in the transition from Burns and Oates to the Universe. When it came back, in 1973, only the table for 1973 was printed. What happened to the data for the previous two years? And how can you print data for the year following the thing's publication? Always before, and soon afterwards, the date of the table is a year or two earlier than the date on the front cover. These are a researcher's gripes, I suppose they weren't thinking of posterity when they did these tables. (What were they thinking of, I wonder?) But here is someone else who didn't care about posterity: though he was very keen 'to embrace the sick'. 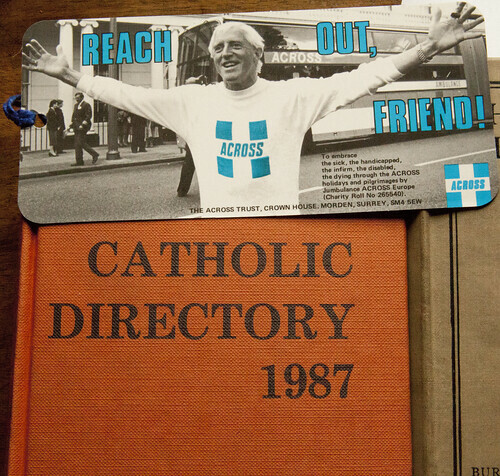 This is the bookmark bound into the 1987 edition, showing the late Jimmy Saville. 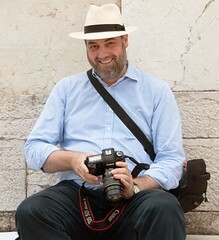 Menevia is in fact shown, although with different boundaries. It covered most of Wales and was later divided to form Wrexham and a smaller Menevia. Another diocese not shown is Hallam, the last diocese to be erected in England and Wales.